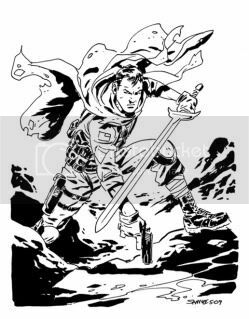 Chris Samnee: Things you Need Thursday: Devil Slayer TPB! Make sure you pick up the Dead of Night featuring Devil Slayer trade, by Brian Keene and myself, on stands today! Will you have some of these trades with you at your con apperances??? I would love to buy from you! This book was a ton of fun and Chris totally rocked on it! I agree...great drawing of the new Slayer and the books were a fun read with awesome art by Chris. Pick it up! I bought all the single issues but will STILL BUY THE TRADE. That's how much of a ho for your stuff I am Chris. Only a few creators get it. You have official groupies, that weird you out yet? I got my copy today. However, I was disappointed that there wasn't any bonus material like character sketches. Agreed, as much as I love Marvel, what's the deal with the special features? By the way, is the group going to be called In-Samnee-acs? Or has that already been coined? Wow, Chris, I really dig the line on this one. I'm so used to seeing the open stuff that this seems rather fresh. Feels like Alex Toth, Pat Boyette and a few others made into a great sandwich. Please keep doing more like this...I'd love to see where you take it.